Merreth stalks down the hallway, anger, thick and dark, rising within her. Stupid! How could she have been so stupid? Bullying one of High Mistress Rehkhell’s scribes and snapping at the other. She’d breached a half dozen unwritten protocols and had enjoyed it. A week’s hard ride to the Watch border, avoiding roads, shunning people like some desperate rogue, had left her worn out and short-tempered. A poor excuse; she’s better than that. Quarters first, then a visit to the High Mistress, that’s what she should have done. It would have given her temper time to cool. Of course Rehkhell would offer hospitality, Merreth is Heir Primary to Sable House. She’d refused and thought she’d been oh-so-clever in doing so. Instead she’d been assigned a keeper — a constant reminder of the ‘favour’ owed to the Watch, whatever the blazes that meant. On top of all that, she hadn’t been successful in fleeing the Red Hand, in fact she’d run right to them. Merreth passes two doorways on her way to the stairwell, both curtained off and framed in dark, richly finished wood. Feet scuttle away from them. Clerks who’d eavesdropped on her earlier and had no wish to meet her now. Footsteps follow her as well. Sarrit. “Lady Merreth?” he asks in a soft voice. Merreth turns, ready to snap at him. Sarrit fidgets, one hand twisting his tunic between his fingers. He avoids her eyes. Behind him and down the hall, Duggel sits at his desk in Rhekhell’s outer office. He shuffles parchments and studies Merreth furtively. Oily little rat. Sarrit nods. “I thought perhaps you knew of lodgings that you considered suitable, that you’d seen on your way here…” Sarrit’s voice falters as he glances at Merreth’s chin. A rivulet of sweat hangs there, then drops to the floor. She closes her eyes and exhales. “I’ll find something,” he says. Merreth sighs. Just bloody wonderful. He’s terrified of me. She shakes her head, turns, and strides to the stairs, her boots kicking dust into the sunlight streaming down through windows set high in the walls. As she takes the steps two at time she worries about her behaviour with Duggel. She browbeat Rehkhell’s Chief Scribe for nothing more than carrying out his duties. And Rehkhell said not a damned thing about it. It was vicious, uncalled for, and … gratifying. That troubles her. An image of Bayllos’s red-soaked ruin of a chest flashes in her mind. She stumbles on the stairs. “Are you all right, Lady Merreth?” Sarrit asks. Good question. “Finding lodging for me should be your concern, Sarrit, not my well-being.” Again, her words are sharper than she likes. A pair of attentive clerks on the spacious second floor landing nod as Merreth strides past them to the next flight of stairs. The stairway overlooks a large common room. At the bottom stand the same two guards she passed on her way up. Short, compact, and powerfully built, they wear simple, loose white tunics. Each holds a polished ash wood staff, the ends resting on the floor. Merreth halts and quickly scans the room. Like most of the buildings she’s seen in Westhold, Watch Hall is built out clay, brick, and timber. Oak panels carved with depictions of Watch history adorn the white plaster walls. Large windows flank the main door, their curtains drawn back, sunlight flooding through. At parchment laden desks minor scribes deal with the daily minutia necessary to govern the Watch while clerks, merchants, and other assorted townsfolk come and go. A trio of Royal Postal Riders rest in a corner, their packs bulging and their clothes dust-covered. The air, noticeably warmer than when Merreth had arrived, is suffused with the scent of sweat, leather, and ink. “There’s no one with me.” Her gaze is drawn to the Postal Riders. What news do they carry? She worries her lower lip, notices and stops. They’re not here for me, she tells herself; there hasn’t been time. Her hands grip the wooden rail of the staircase. She forces her fingers to uncurl. A dark patch in the tans and browns of the commoners and the more vibrant blues and greens of the merchants catches her attention. Off in the corner, their backs towards her, two noblewomen gesture dramatically. The taller one, clearly the leader, berates a helpless scribe. Their house leathers are the color of dried blood. Merreth’s chest tightens. “Red Hand,” she whispers. “I know who they are,” says Merreth. Her lip curls. She remembers Tiandraa’s venom when the betrothal was announced. Rot in the House is not repaired by inviting vermin to guest with you! Tiandraa and Lyadkell appear in full cry; snatches of their tirade rise above the general cacophony of conversation. Others in the room begin to move away, except for the postal riders, who watch with interest. Merreth frowns as she studies the two Red Hand noblewomen. Bullies. That’s all most of them are. She glances at Sarrit, recalls snapping at him and abusing Duggel. She feels uncomfortable, even embarrassed. Sarrit starts down the stairs. “Wait.” Merreth seizes the back of his tunic, jerking him to a halt. Her eyes never leave the noblewomen across the room. Leave, damn you! Now! A clerk bustles through crowd and attempts to placate the nobles. The hapless scribe eases away while the two women confront the clerk. More finger pointing and gestures but the clerk remains calm. He even dares to make eye contact. Tiandraa and Lyadkell turn on their heels and stalk out the door. Merreth counts to twenty while she watches the entrance. “Let’s go,” she says. She makes her way down the stairs, brushing past the two guards, Sarrit following. What the blazes is the Red Hand doing out here? The same thing as her, according to Rhekhell. Was it really that it or were they here because they thought she would be here, sooner or later? Merreth grimaces at the thought. She could chase that worry around until it wore a hole in her head. No, her concern now is staying out of Tiandraa’s and Lyadkell’s sight for as long as possible. They’d find out she was in the Watch sooner or later; she prefers later. She threads her way through the crowd towards the main entrance. As she reaches for the handle the doors are flung open and one hammers her in the face. Merreth stumbles backwards, arms flailing, then regains her balance. She runs a hand across her lips and looks at the wet smear of blood on her gloved fingers. 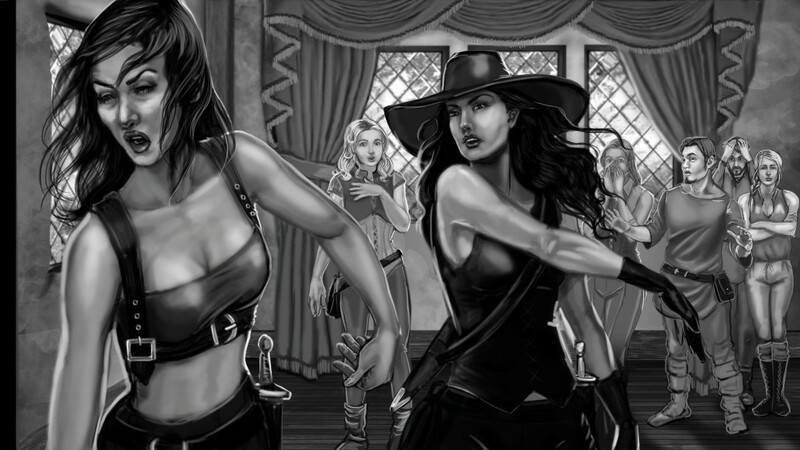 “Good Goddess, it’s a Little Whip!” Tiandraa steps though the doorway, Lyadkell right behind her. Tiandraa is just as Merreth remembers. Wetter, though. Her black hair hangs in loose sweat-sculpted licks. Above the waist she wears only a riding breast band, its mud-red fabric blotched and darkened from perspiration. Her breeches are similarly mottled. Large eyes in a long face are set above a wedge-like nose. Eyes in the room turn toward them. Merreth wants to leave but the casual, cavalier insult in front of dozens of commoners roots her to the spot. Their silence closes in as she struggles to frame a reply. “Mistress Merreth?” He looks at Merreth, eyebrows rising. “What would run counter, the attending part, or the bit about leaving Merreth in the nearest stable?” asks Tiandraa. Clerks, merchants, and townsfolk, their respective affairs and concerns forgotten, stare at the group. A malevolent gleam dances in Tiandraa’s eyes. She turns and strides out the still open doors, followed closely by Lyadkell. Merreth clenches her fists in anger and frustration. Damn it! What the blazes is wrong with her? Didn’t she just plan to stay as far away from the Red Hand as she could? Not ten minutes later and she’s caused a major confrontation with them. But it had felt so good to slap away Tiandraa’s mocking smile. And at the same time, though, prove to every commoner in the room she’s no better than those red-leathered hags. Behavior hardly befitting an Heir Primary. Still, something inside her, slick, cold and dark, enjoyed the moment immensely. “What was that about a second?” she asks Sarrit. Sarrit gathers himself. “Mistress Merreth,” he begins. Want to know more about Lady Merreth? Check out her character description. 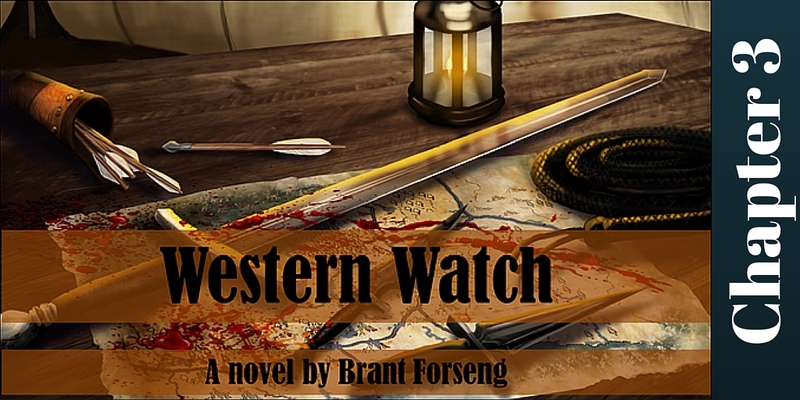 Return to Western Watch Chapter Index. S. Yoshiko hails from California’s Bay Area but moved to the country at a young age. She took a lot of inspiration from animals and nature, mixed with her interest in fantasy. The medium has changed over the years but the idea of her art and interests remains mostly the same: representational with a mix of dark and light themes, real and fantasy. She does a lot of portraits. S. Yoshiko has done many depictions of Lady Merreth, as well as various scenes from her adventures. More of her work, along with contact information, can be found here. Copyright © 2019 Forseng Fiction All Rights Reserved.